Started by a 15-year Navy veteran, Workshops for Warriors provides 16 months of free training for post 9/11 vets interested in advanced manufacturing. Even better: the group has a 100% job placement rate. 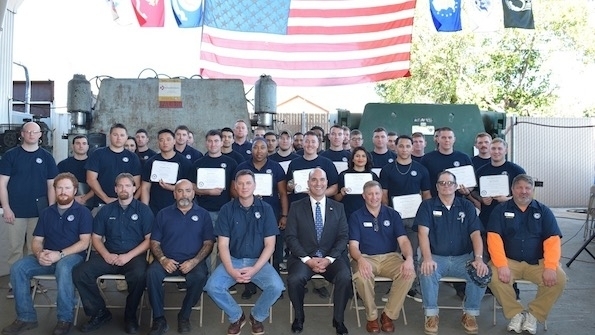 Last week, 46 U.S. veterans graduated from a trade school program in San Diego with not just a diploma in hand, but jobs awaiting them in advanced manufacturing. The newly minted CNC machinists, CAD/CAM programmers and welders made up the largest graduating class yet at Workshops for Warriors, a nonprofit that provides a free 16-month training program in welding and fabrication for veterans transitioning into civilian life. Graduates are placed at manufacturing companies large and small--many of them right in San Diego, a manufacturing hub where their skills are in high demand. Since its founding, Workshops for Warriors has placed all of its graduates in jobs with starting salaries typically around $50,000. Even those who complete only part of the program often land skilled jobs that pay a living wage, says founder Hernàn Luis y Prado, a veteran himself. Prado served 15 years in the Navy, with combat tours in Afghanistan and Iraq. Seeing more of his fellow service members “die of suicide and drugs in San Diego … than bombs and bullets in Baghdad” compelled him to start the organization in 2008. “If we want to help veterans, we need to have a secure civilian path that they can be trained into,” Prado said in a statement on the organization's website. Most students in the program are post 9/11 veterans, ranging in age from 22 to 35 and transitioning out of the armed forces sooner than they expected due to military drawdowns or major injuries. In San Diego alone, more than 40,000 veterans transition out of service each year. Students can earn credentials from industry organizations including the National Institute for Metalworking Skills, Mastercam University (computer-aided manufacturing), SolidWorks (computer-aided design) and the American Welding Society. Since 2011, 238 veterans have been trained on-site in the program, receiving close to 600 third-party nationally recognized credentials. Workshop for Warriors’ next 16-month session begins January 4. Students choose either the welding or machining track, training on a long list of up-to-date equipment. Courses include computer-aided design, machinery repair and maintenance, CNC and manual machining and turning, and welding and fabrication.